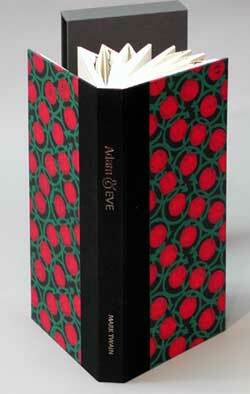 EXTRACTS FROM THE DIARIES OF ADAM & EVE as translated by Mark Twain was made as a limited edition of 38 copies during the summer and fall of 2003. 13 x 5 3/4 x 1 1/2 inches. 46 pages. Out of Print. 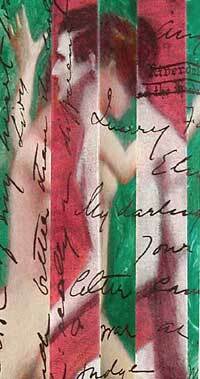 Mark Twain wrote the imaginary diaries of Adam and Eve as independent works over a period of nearly fifteen years. He undoubtedly relished being able to give voice to the first representatives of the human race with his characteristic insight and humor. Eves diary offered him the bittersweet chance to create a voice filled with kindness, intelligence and curiosity that some would say stood as a eulogy to his wife Livy. He wrote Eves diary shortly after she had tragically died after a long illness at the age of fifty-eight. The diaries have been published here in a French door style of binding with a concertina fold which allow each diary to be read as single, integral work while at the same time allowing passages from each to be easily compared. 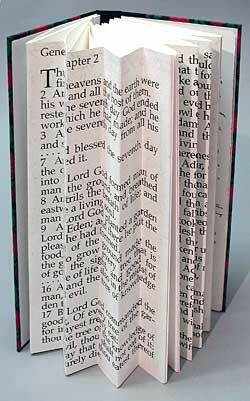 The concertina also provides a place to print the verses from Genesis that were Twain's source and, on the inside fold, the handwriting of Twain and his wife, Livy. Adam and Eve draw closer to one another and ultimately embrace. 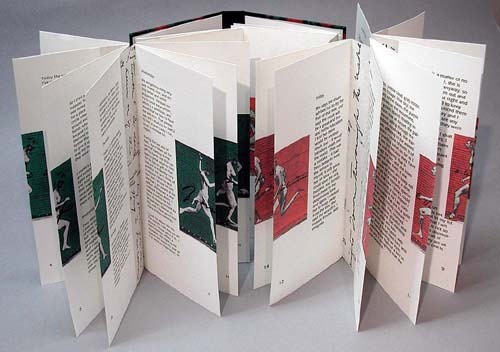 This movement toward an embrace has been given a visual counterpoint by use of the running figures based on the photographs of Eadweard Muybridge published in 1901. 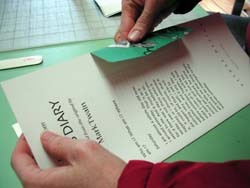 Each page of the diaries contains a folded and collaged image and a scrap of the handwriting of Mark Twain and Livy from letters they exchanged during a two year period when doctors forbade Twain to see Livy in her sickroom. The final drawings have been made as monotypes with pastel and have been printed as digital pigment prints. 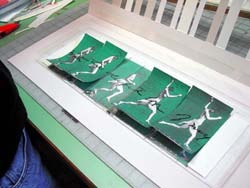 The prints have been cut out so that they can be opened across one another to overlap and to form a visual embrace. 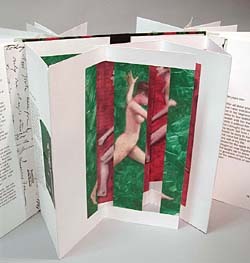 A separate print made as a composite of the last images in the book has been folded into an accordion and included in a pocket at the back of the book. The digital pigment prints have been printed on an Epson 2200 pigment based digital printer which produces images which are water-fast and resist fading. 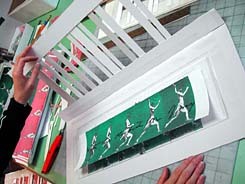 The concertina and French door structure with cut-out pages and collaged folded sheets has been designed by Charles Hobson and assembled with the assistance of Alice Shaw. 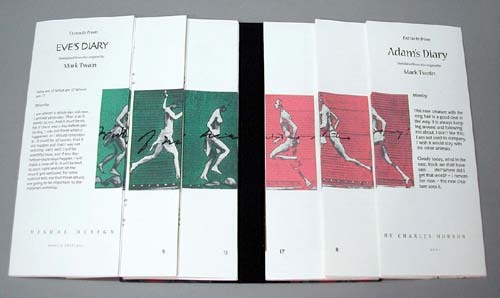 John DeMerritt made the board covers and slipcase. 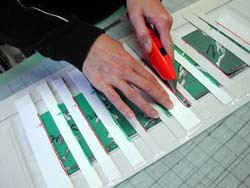 Some notes about the production of the book. 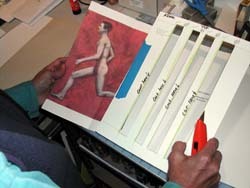 Each of the running figures from the Muybridge studies has to be cut from a larger sheet and then scored to be mounted on the edge of each page. 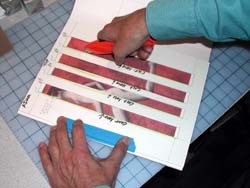 The large prints at the back of the book had slits cut in them using a pattern which required strict concentration.